According to FBI stats, over two million laptops are stolen every year, from homes, cars, coffee shops, college campuses, and hotel rooms. Only 2 or 3 percent are ever recovered. I'm always surprised when I see people set their laptop or smartphone on a table, then saunter up to the coffee shop counter to order. But it's not always carelessness that results in a laptop being swiped. Recently, a woman sitting in a Starbucks was actively using her laptop, when three men grabbed it and took off. So keeping your laptop or netbook safe involves a combination of common sense, awareness, physical security devices, and software strategies. Let's start with devices that make it harder for your portable computer to be carried off by someone else. Physical security devices are used to keep your laptop from being stolen or used without your authorization. One that won't cost you anything is the trunk of your car. To avoid a "smash and grab" theft of your laptop, store it in the trunk while traveling, instead of on the seat where it's visible to passers-by. 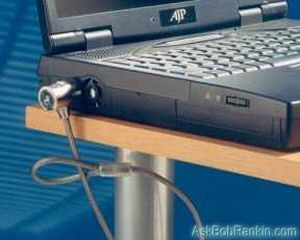 If you have to leave your laptop unattended, the most basic physical security device is a laptop security cable. This cable connects to your laptop and secures it to a non-moveable item in your home, office, hotel or conference room. For example, you can connect your laptop to your desk, or the leg of a conference room table. The cables usually have a combination or key lock device, and attach to the security slot found on most laptop computers. Expect to pay about US$40 for a high-quality laptop security cable. A determined thief with a bolt cutter could foil this device, but it certainly makes it a lot harder to grab and run. Another physical security device that you can add to your laptop is a theft protection plate. This plate, which applies like a sticker on steroids, is used to identify the owner of the computer and to prevent people from trying to resell your stolen computer. 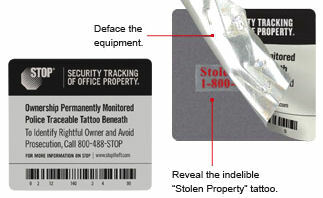 If the plate is removed then it leaves a permanent acid "tattoo" on the laptop, indicating that it has been stolen. These security plates are available from STOP for about $25. A small version is also available for tablets, smartphones, cameras and other mobile devices. Biometric devices can also be used to ensure that if your laptop is stolen, it can't be used by someone else. Biometric devices include fingerprint scanners and retina scanners. These devices are commonly found on newer smartphones, but can be added to just about any laptop. The fingerprint scanner comes standard on some Toshiba laptops. Some smartphones have the "face unlock" feature, but these technologies are not fool-proof, though. A ZDNet article showed how the new Samsung Galaxy S10's face unlock could be fooled by a video of the owner. FrontDoor Software's Laptop Security software can help to get your laptop back if it's lost or stolen. The program displays ownership information at startup, and can also report tracking information to the owner if the laptop goes online. Also, if your laptop is stolen, you can login to the Front Door website and enter a lockdown code that will help to protect your information. You can even send a personal message to the thief, or cause an audible "This laptop was stolen!" alarm to be played. FrontDoor Laptop Security works on Windows and Mac OS X. The software costs $9.95 for a one year license. Prey is a free cross-platform tracking app that runs on Windows, Linux, Mac, Android and iPhone/iPad devices. If your laptop or other mobile device is lost, Prey provides location data, Webcam, and screenshot reports. Prey can make your lost or stolen device sound a loud alarm, snap a photo of the person using your computer, or display a message onscreen. It can also lock down your device or wipe stored passwords, via remote command. The free version supports up to three devices. Absolute Home & Office (formerly called Lojack for Laptops) is another software-based laptop recovery product. This company provides you with a Theft Recovery Team that's actually a licensed private investigation agency. They will work with local law enforcement and Internet Service Providers, using information sent from the stolen computer, to assist local police in recovering your computer. If your stolen device isn't recovered within 60 days, Absolute LoJack will pay up to $1000 for a replacement. And of course, there's always the "inside job" that nobody sees coming -- the threat of hackers and snoops that attack through viruses, ransomware and other forms of malware. Every laptop should have an up-to-date anti-virus software package installed, to identify and remove malware from your system. Read my companion article Free AntiVirus Programs for my recommendations to keep your computer safe from viruses, ransomware and other threats. File encryption is used to protect your data from hackers, thieves and others who may access your computer without permission. Windows has BitLocker, which can be used to encrypt an entire hard drive. Bitlocker is available on Windows 7 Enterprise and Ultimate editions, Windows 8.1 Pro and Enterprise editions, and Windows 10 Pro, Enterprise, and Education editions. Another option for encryption is the free VeraCrypt software, which can encrypt a hard drive partition, USB flash drive or external hard drive. VeraCrypt works on Windows, Mac and Linux systems. Learn more about encryption in my related article Time to Start Encrypting Your Stuff?. In addition to physically securing your laptop and protecting your computer with security software, you also need to take steps to protect your laptop with strong passwords. While it is important to set up a user account password for your laptop you will also want to set up a power-on password. These passwords will prevent unauthorized people from logging in to your computer, or accessing it by using a boot-up disc. To create your and power-on password you will need to enter your BIOS security set-up menu. This is usually accessed by pressing the Del, F1 or F2 key while your computer is starting up. Try to use passwords that include a combination of at least eight letters and numbers, and stick to a password rotation schedule that changes your passwords on a regular basis. Make sure you remember the passwords, or you'll lock yourself out! Here's one other point on passwords, particularly relevant for travelers. If you allow your web browser to store your passwords, and your laptop is stolen, you've given away the keys to the kingdom. Roboform and similar tools can keep all your passwords handy, but with the protection of a master password. See Here's Why Your Password is Hackable for more information on password strategies. Here a few more practical tips you can use to secure your laptop and your data. Consider using free Portable Apps that can be loaded on a USB flash drive. Using this approach, all your software and your personal files never need to be stored on the laptop's hard drive. This has the additional advantage that you can plug the flash drive into any available computer, and work without fear of leaving behind any personal data. Just be sure that the drive and the laptop don't travel together in the same bag. If you'll have Internet access while traveling, an even better solution might be cloud-based apps and storage. By managing your email, documents and other tasks with free cloud-based services, all your data is stored online, and you don't need to carry a flash drive that could possibly get lost or stolen. Google Docs, Google Sheets, and Google Slides together provide online word processor, spreadsheet, and presentation capability. Microsoft offers a similar suite of online office tools. You can even find free web-based photo editors. And finally, if you use wifi while away from home, you need to take some extra security precautions. See my article The Big Problem With Free Wifi Hotspots to understand the risks, and learn how to protect against them. To keep your laptop as safe as possible you will want to combine physical, software and use password strategies. While not all of the above security methods are applicable, practical or necessary for all laptop users, it is still important to understand your security options so that you can alter your security strategies as your computer use changes. Most recent comments on "Are You Securing Your Laptop? (Here's how...)"
Sometmes I like to post your especially useful articles (like this one) on Facebook. However, unless I disable the feature, the post shows a giant version of your rather-low-res profile photo. Could you do something to change that? Another encryption option is to install an SSD with internal encryption. I consider encryption, of any sort, the best defense. If the laptop is stolen, they might get a nice piece of hardware but no personal files. I represent STOP, which was mentioned among the laptop security solutions. STOP has no business relationship with Mr. Rankin or his website whatsoever, but we appreciate the mention, thank you! That said, Looking at the comments, yes, encryption (data protection) is important. But as Mr. Rankin emphasizes in his article, preventing loss and theft is the first step, of course. That is accomplished by common sense vigilance (treat your laptop as if it were your wallet, purse, backpack, credit card). Cable locking systems and STOP Security Plates are among the security measures that are quite effective. And while STOP also offers a software agent that can encrypt directories/documents, geolocate by WiFi triangulation and remotely bootlock the device, STOP never offers this approach as the first layer of security. It's all about Non-Events, after all. STOP Security Tracking of Office Property. I used this when I had my laptop last year. It is FREE and works like a charm. Great article. A couple of caveats. 1. If storing in the trunk, put the device in the trunk as you enter the car, not as you exit. Remote access can be mimicked or stolen. If you go to a restaurant and lock your computer, etc in the turn, it instantly becomes a target for thieves who prey on such ineffective means. If you do it when you get in, you don’t paint a target on your car when you get out. Best, have a cable lock and or firmly affixed lock box in your trunk to further secure your laptop. 2. Be careful with cables. They are great, but finding something immovable in a conference room or hotel room can be problematic... even if present, it may be out of reach for your cable. If you leave devices in a hotel room, if they will fit in the safe, use it. If not, find a place that is as secure as possible and lock your cable and device around it. 3. Offices are not as secure as most would think. My former employeer wrote people up for having a computer not secured by cable even in an office or conference room. 5. Comment: The bios password is great. QUESTION: If someone pops out your hard drive, can they access your unencrypted files? I suspect yes, but am not certain. Thanks for all the great articles and tools! When storing electronic devices inside a vehicle, it should be kept in mind that the inside (cabin and/or trunk) of the vehicle will be about 30 degrees higher (hotter) than ambient temperatures; especially in direct sunlight and/or summer time. The best recommendation is to NOT leave your laptop in any (part of an) unattended vehicle. Even if the vehicle is in your driveway or garage; never leave valuables in plain sight. If you must leave it unattended in a vehicle: Make sure that the laptop is turned-off and also keep in mind that the act of moving it to the trunk for safe keeping may be an invitation to someone who observes you locking it in the trunk. If a theft of a laptop does occur, you should report the incident to the local police department. Although it appears that the general and accepted consensus is to store the laptop in the trunk of the vehicle; I am in the inclination to store a laptop inside the vehicle cabin under the back of the front seat or at least covered, so as to not make it visible and invite theft. But most importantly, DO NOT retain your vehicle registration inside the vehicle, as this will allow the thief to not only steal your laptop but also have access to additional personal information. Oh yes! Don't forget to lock your vehicle doors. In answer to Bryan Hanes query. Yes, data can easily be accessed from an unencrypted hard drive. The only problem with a bios password is all you have to do is remove the bios battery and reset the bios.It is a little more difficult on laptops some have the bios battery in a hard spot to get to. It has been a couple of years since I have been away from your website. Anyway, I am Back! I love VeraCrypt. It has been tested (by Me) Tried and True. I have it on my laptops across platforms! VC is a fork of the former TrueCrypt which is no longer. VC is even better so It would be good to give a donation to the developers of VC - - Really Good!